Looking for a vibrant office space to call your own? Step into our premises and book a tour to view one of the most stylish coworking spaces in Malaysia. Our private offices provide you with the security and privacy you need to get work done. All our offices are equipped with sturdy workstations, ultra-ergonomic chairs, air-conditioning, and carpeted floors. You can settle for our fully furnished rooms or live your interior designing dream. We’re happy to customise and design a plan for you to ensure that your time with us is as best as it can be. Each Colony location is designed as a unique personality of its own. With designs integrating European architecture with contemporary furnitures, Colony creates a warm and welcoming space that adapts to the modern palate. Colony ensures a fully-immersive luxury lifestyle experience, whether it is welcoming your guests or a butler service, our signature hospitality takes care of you while you’re at work. Our community of matured startups and corporates want the elevated working environment, the comfort, and the energy of a coworking space. Mingle with distinguished professionals at thoughtfully curated events that brings your brand to newer heights. Colony is housed in Kuala Lumpur's most prestigious addresses. With distinctive design elements, each Colony is a unique personality of its own. Find a coworking space, serviced office, event space and meeting rooms in your preferred location. Colony's third location is strategically located in the heart of Malaysia’s largest rail transportation hub. Colony @ KL Sentral is housed Q Sentral, an MSC Grade 'A' building with GBI Gold accreditation. As the most connected transfer hub for all major rail systems, access seamless connection in and out of the city with neighbouring shopping mall and accommodations just a few minutes away by foot. Located in the heart of Kuala Lumpur’s Central Business district and nestled between KLCC and Pavilion, Colony @ KLCC is a two-storey high ceiling coworking space housed in Vipod Residences, spanning 19,000 sq ft. Colony @ Eco City is situated in the New Golden Triangle, with excellent connectivity to major hubs such as Bangsar, Mid Valley City, and Damansara. This 5 storey coworking space sits above Eco City mall and a mere minute walk to Abdullah Hukum LRT Station and KL Eco City KTM Station. >Eat, play, work, and rest. Strike the perfect balance with facilities tailor-made for your every wants and needs in the office of your dreams. When life throws you lemons, just keep swimming. 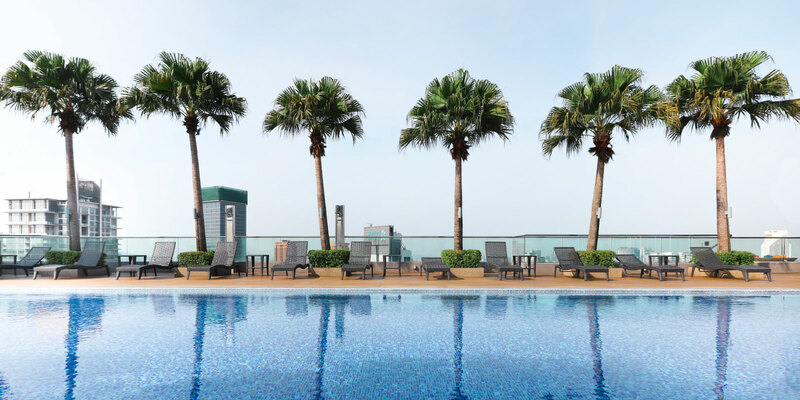 Take a breather from work with a few laps in a pool overlooking the city. Let the water wash your stress away! A comfortable nap area invites you to take a breather from work in a world of dreams. Unwind those knots and rejuvenate with a visit to the massage room! Fret not, working parents! Our dedicated kids play rooms allow you to focus on work without the hassle of worrying about your children! Maintaining a healthy, active lifestyle is no longer an abstract concept with a rooftop gym. Work out with full view of the KL city skyline. Interested? Our team will reach out to you! Book a private viewing and let our specialists design a plan based on your lifestyle needs!